Alstott rushed for a school-record 3635 yards at Purdue, with a season high of 1436 in 1995, and also scored 42 touchdowns (39 rushing, three receiving). He was chosen by the Buccaneers in the second round of the 1996 NFL draft and rushed for 377 yards on 96 carries as a rookie while catching 65 passes for 557 more yards. He split time with RB Errict Rhett, but had a new backfield mate in ’97 in rookie RB Warrick Dunn, creating a highly effective tandem. Buccaneers went 10-6 to finish second in the NFC Central and qualify for the postseason as a Wild Card. Won NFC Wild Card playoff over Detroit Lions (20-10). Lost NFC Divisional playoff to Green Bay Packers (21-7). Alstott followed up with consensus first-team All-NFL selections in 1998 and ’99, rushing for a career-high 949 yards in the latter year. While not a particularly good blocker, he provided a power-running alternative to Dunn and was named to six straight Pro Bowls. His running style led to injuries that lowered his production from 2000 on, although he remained effective between the tackles and a good receiver out of the backfield. A neck injury limited Alstott to five games in 2003 and, in his last four years, he didn’t carry the ball more than 67 times or gain more than 230 yards, although he was still useful in spots. Overall, in an 11-year career that was spent entirely with the Bucs, Alstott ran for 5088 yards on 1359 carries (3.7 avg.) and caught 305 passes for 2284 more yards (7.5 avg. ), scoring a franchise-record total of 71 touchdowns. He gained another 341 rushing yards, with seven TDs, and 161 pass receiving yards on 21 catches in the postseason. 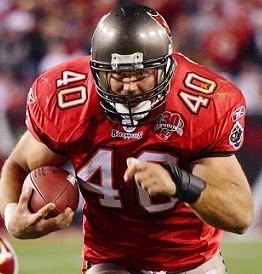 Alstott received first-team All-NFL honors three times in addition to the six Pro Bowl selections.